Director: Frank Coraci. Cast: Adam Sandler, Drew Barrymore, Christine Taylor, Allen Covert, Matthew Glave, Angela Featherstone, Alexis Arquette, Ellen Albertini Dow, Steve Buscemi. Screenplay: Tim Herlihy. Twitter Capsule: The light-headed silliness and magic-marker palette signal a disposable picture but it maintains a sweet appeal. VOR: ③ Still proving generative; a Broadway musical recently bowed. Sturdy as Sandler films, yet not too representative, since sentiment isn't overwhelmed by scabrousness. Launched other, worse movies. First things first: the greatest joy of Frank Coraci's The Wedding Singer is that for the first time, at least as far as I know, one of the alums of early-90s Saturday Night Live has made a film that doesn't sport a shrill cynicism as a badge of honor. Moreover, without outlawing wholesale the sight gags, deranged gimmicks, or crude haw-haw humor that made Adam Sandler famous, The Wedding Singer makes the comparatively daring gesture of giving Sandler what we've never seen him with before: a heart. Sandler's character, sweetly if pathetically named Robbie Hart, slouches early in the film on his front porch while his Bananaramish recently-ex-fiancée (Angela Featherstone) catalogues all the reasons she couldn't marry a wedding singer. Sandler, in a characteristic moment of throat-ragged, face-contorting apoplexy, suggests that this information is "again in the category of things you might have brought to my attention YESSTERRDAAYYY!!!!" The difference, though, between this scene and Sandler's similar growl/bark outbursts in Billy Madisonor, at least, in Billy Madison's TV ads, which were all I cared to endureis that his anger is finally coming from somewhere. He's reacting to an actual predicament instead of just cosmically, pathologically pissed. From my point of view, it's more fun to laugh with Sandler than just to laugh at him. Unfortunately, the concept of Sandler playing an actual character instead of just a choleric time-bomb (he apparently ceded that job to John Goodman in The Big Lebowski) is revolutionary enough that the rest of the film isn't quite sure how to deal with him. 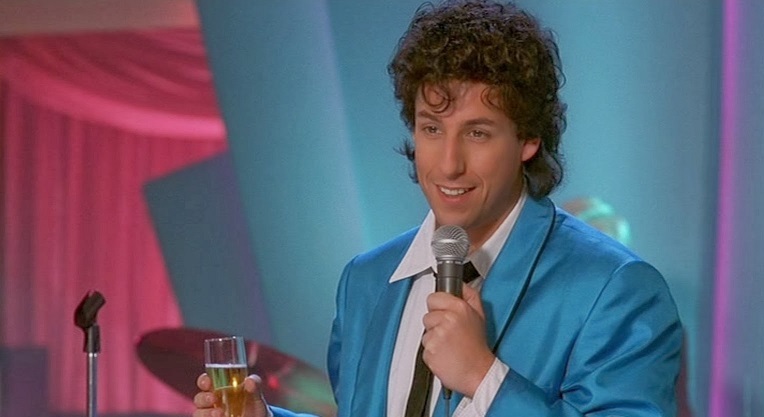 Too much of The Wedding Singer has a disconcerting reluctance, reining itself in at unexpected moments and failing to capitalize on several potential jokes, as if the filmmakers believe that by defining a distinct comic persona for Sandler, they have forfeited their right to take any character or situation gleefully over the top. In other words, Adam Sandler goes to all the trouble to stretch his formula a little only to be rewarded with lame gags like naming a character "Julia Gulia". Billy Idol, a sure-fire icon of 80s Bad Taste and General Wrongness, has the good humor to show up for a few scenes with Sandler, but then the film just drops him for what must be the thousandth shot of Drew Barrymore giggling. Barrymore, for her part, is in the unique position of being at her most winning when she's not saying or doing anything. Point of view shots in which Sandler watches her Julia, a waitress, cater to a wedding party are a perfect medium for Barrymore's cutesy but utterly unsubstantial charms. Each time she's required to drive a scene, though, or even sustain a close-up reaction shot, she either gets all "actressy" and sobbyproving my suspicion that Drew Barrymore should never, ever film an introspective self-study before a mirroror she just fidgets and tee-hees. Poor Drew. I dug her in Everyone Says I Love You, and I could care less that she didn't do her own singing, but that film aside, she seems forever consigned to play ingénues and vamps who are never as uniquely and interestingly vampy-ingenuous as she is.